Last July, a young boy was riding on a jetski near the Oceanside Harbor when he was thrown off the watercraft. His family watched helplessly as big surf threatened to slam him into a rock pile. A boat rescue was too risky, but a special lifeguard dog was on hand. A Labrador retriever hopped in the rough water and swam toward the boy with a long rescue tube. The boy clung onto his custom lifeguard jacket as the dog pulled him to a boat where Niki Burgan, a certified lifeguard instructor, beamed with pride. Niki created the SoCal H2O Rescue Team in 2009, the U.S.’s first K-9 lifeguard team, and Rummy the retiever has been making rescues since. 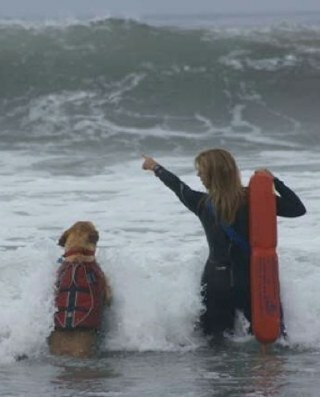 In the wake of budget cuts that have slashed funding for lifeguards, the dogs have saved 47 lives. While the SoCal H20 Rescue Team has saved lives, it was born from tragedy. Niki lost her mother, step-father, and only sibling in a plane crash off the coast of Carlsbad in 2007. Local officials only had minimum resources to try and recover the bodies. Niki later became part of the solution for future families who may encounter that same problem. Thanks to Julia Frerichs, LMT, for sending the link!